Since the 8th millennium BC,Turkey was home to the oldest human settlements on earth. During the 3rdmillennium BC an early Hittite nation settled in the central plains. With the migration of people from Greece the empire collapsed and later two centuries later Alexander the Great’s army took over. After the 2nd century BC the coastline became the commercial and political core of the Roman province of Asia Minor. 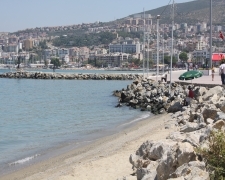 Kusadasi is one of the most popular seaside resort areas in Turkey and attracts a large number of tourists from all over Europe every year. With a population of approximately 50,000 people and the close proximity to many ancient cities and archaeological sites it is an attractive location for tourists. 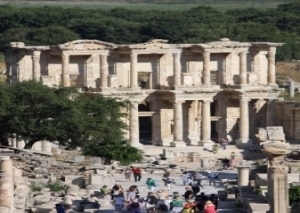 A short bus trip out of Kusadasi (about 20minutes) will take you to the well preserved ancient city of Ephesus, one of the most spectacular examples of ancient Roman Architecture and one of the best preserved cities of the Roman times. 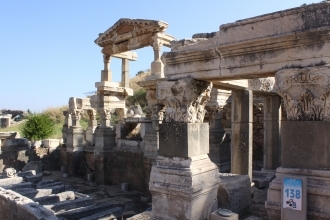 Ephesus was known as one of the most important cities in the Roman Empire and grew to be the second largest city of it’s time. 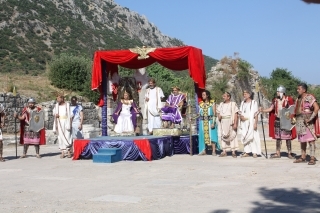 The Christian Shrine, thought to be the home of the Virgin Mary and the ruins of St. John’s Basilica, are also within the vicinity. When visiting mosques in Turkey, short pants, tank tops and revealing clothing are not acceptable. Women should have their shoulders and legs covered and should have a scarf available to cover their heads when entering. Visitors will be required to remove their shoes before entering all mosques. 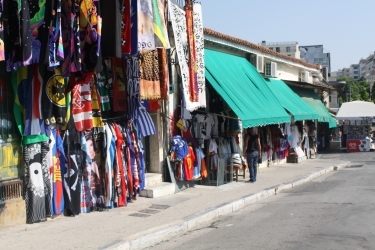 (socks are highly recommended) Outside the mosques normal dress or resort wear is acceptable around Kusadasi. Fish, soups, rice dishes and stews feature prominently on their menus. Also Sis Kebap (lamb grilled on a skewer) and Lamb on a spit (doner kebap) are Turkish inventions. Pistachios, almonds, dried apricots and reaiins are served as snacks throughout the day and are also common in Turkish cuisine. Dessers such as sutlac (baked rice pudding ) and asure (fruit and nut pudding ) or local melons feature highly. Send us your story about a holiday destination or experience in Turkey.